A Complete TwoUp 3D Printer Review – What’s New? Quintessential Universal Building Device, Inc. (also known as Q3D) is an innovative company that got its first big break on Kickstarter.com. Their campaign on Kickstarter rose over $400,000 in funds and created quite a stir among 3D printer enthusiasts and even those who were interested in experiencing 3D printing for the first time. They have developed and produced several models of 3D printers for sale and have found a niche in the marketplace by providing low-cost 3D printer kits with quality printing capability. The model promoted in the Kickstarter campaign was the OneUP 3D Printer and their first product offered for sale. Since then, they have added two additional models to their product lineup, the TwoUp and ThreeUp. Q3D has had a clear intention from the very beginning, to expand the availability and practical use of 3D printers to users around the globe. This intent or mission has had a direct effect on their printer designs and engineering, as they are committed to offering low-cost 3D printer options that still offer quality printing and a high degree of functionality. Between the Kickstarter.com campaign and the initial reaction on the market to the OneUp, it is safe to classify their efforts as a success. Anytime a company offers a follow up model to an initial product that was successful it can sometimes have a hard time meeting expectations. Q3D has claimed the TwoUp is every bit as good as their first offering and in many ways even better. Let’s take a look in this TwoUp 3D printer review and see what it can offer to the 3D printing world. Overall Recommendation – Worth the Investment? The TwoUp is designed as a kit, meaning if you purchase this 3D printer it will arrive at your door with the everything you need to get up and running, but you will need to build the unit using all the components included in the package. Depending on your familiarity with technical designs and experience with building items such as this, the degree of difficulty can vary quite a bit from person to person. Some have reported their build process was easier than expected and others have reported the exact opposite. If you are somewhat technically inclined, I would not let the build experience of other users sway you too much. A lot of the build experience comes down to the skills of the individual. However, one thing we noticed in our research that gave us a small amount of concern is the many reports from users about holes not aligning properly, mismatched parts and a general lack of uniformity in the parts provided, the instructions and certain elements that make all the pieces come together. The degree of the problems appeared to be minimal as these issues did not prevent the printer from being assembled or working properly. But, you should not have an expectation of perfect quality. At a price of approximately $280 (see here for pricing data), I suppose a few things like this should be expected though. Print Quality: Q3D has claimed the TwoUp matches or exceeds the print quality of some printers that cost twice as much or even more, and they are right. 50 microns is very good for a printer in this price range and the TwoUp does an efficient and quality job. It certainly isn’t the right model for large commercial projects that require top notch quality and fast production, but that is not its intended purpose or price category. Build Area: It comes equipped with a very nice build area measuring 6.89 in. x 6.89 in. x 4.92 in. and it ranks right up there with printers that have build areas of similar size but cost considerably more. Connectivity: The printer has a USB connection that allows you to easily connect to a PC of your choice. Additionally, it is micro SD capable which allows you to be a bit more mobile and extra functionality. Process: You need a little patience to first setup and get the printing function of this 3D printer working properly. Once you are finished with the actual building process of the unit, it will take you a few attempts to get all the settings rights in order to effectively be able to print a good quality design as intended. Part of this will depend on how much experience you have had in the past working with 3D printers as small tweaks in various settings can make a big difference in the quality of the product printed. Noise: The printer does generate a significant amount of noise while printing. It is not at levels that will exactly shake the earth, but significant nonetheless. Therefore, it is probably best to ensure you use the unit in a workshop, basement or another area that will keep others from being disturbed. Speed: Additionally, while the quality of printing tends to be as good or better than models that may be priced in higher categories, the printing process does tend to be slow. 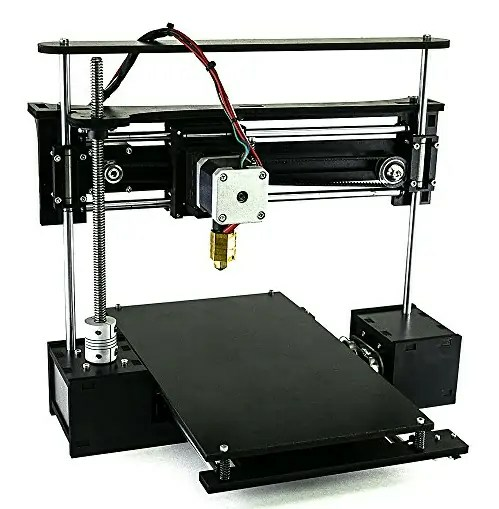 If you have worked with other 3D printers then you may be well aware that generally it is a slow process, even a bit slower with a printer in the $280 price range. If you are expecting the TwoUp to print new designs every few minutes then you will most likely be a bit disappointed. However, if you can appreciate the value in the quality of print versus the cost of the printer then you should not have many frustrations. The biggest advantages of the TwoUp 3D Printer are the large build area, high print quality and overall ease of use. The unit overall is very easy to build and operate even for those that may have never worked with 3D printers before. It may take a little time and patience, but Q3D did a very nice job of producing a printer that a beginner can get up and running in just a few hours. As stated above the print quality far exceeds what you would expect of a printer in this price range, which makes the TwoUp a good value by most measuring sticks. It’s tough to find too many faults with a 3D printer that is under $300 and actually prints good quality designs. However, if we must choose a couple of negatives, then it would be the noise and printing speed. The noise is loud enough you need to pay attention to where and when you use the printer. Additionally, the slowness of the printing could become frustrating if you have plans for any type of volume type work to be done. By all accounts, this is a very nice 3D printer and provides an excellent value to consumers. It is probably a printer that is best for beginners or moderately experienced 3D printing enthusiasts. More experienced users will probably require a bit more performance out of a printer unless they are looking for a fun project to toy with in their spare time. If you are new to the 3D printing world, then have a look at the TwoUp 3D printer, it might be exactly the right unit to use break into the 3D printing world for the very first time. Be sure to check out this listing for the latest pricing information. Customer support for the q3d printer is horrible. We purchased through Amazon.com. it arrived with parts missing and damaged.but, we delayed in asking for parts over the 30 days. (gave it to our son for a present which was beyond the 30 days- didnt realize it at the time) We have been trying to get the correct parts, contacted customer support multiple times, eventually to have amazon call (the only time we receive a response was because amazon called the company) to this day, one year later we still have a nonfunctional 3d printer. It has been a nightmare. Sorry to hear that Susan! Unfortunately this is the case with many 3D printing companies right now.